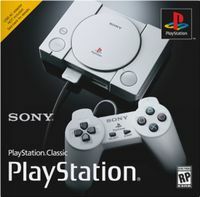 PlayStation Classic was a miniature video game system by Sony. It was released after the success of microconsoles by Nintendo, the NES Classic Edition and the Super Nintendo Entertainment System Classic Edition. It was released on December 3, 2018. It contained twenty built-in games, running on the open-source emulator, PCSX ReARMed, and was designed to resemble the PlayStation. It contained two PlayStation controllers without dual-analog sticks, which connected to the console using a specialized USB connection. The power was provided by a standard mini USB plug and wall adapter, and the video was output through HDMI. Twenty games were included in the PlayStation Classic.